This week we are joined by Heart Avail's lead singer, Aleisha Maureen, and local hilarious comic, Folger Emerson. Find everything Heart Avail at their website. Find Folger on his personal Facebook where he adds everyone. This week we're throwing back to episode 70, which was released this time last year. Come listen and hear how the show has changed. We welcomed local novelist Alex Fedyr and improviser David Honeycutt. This week we are joined by Extremist Movie Debate's Jeff Dodson, and Comic & Event Coordinator Mark Morris. Find Jeff and the rest of the Extremist Movie Debate crew right here on the Pants Pending Studios Entertainment Network. Find Mark Morris and all his great events on his Facebook page. Make sure to check the events tab to see which show you want to attend. This week we welcome back Dylan Nelson from Ranking The Kingdom, and our very own internet celebrity Burr Martin from the Burr/Jani Martin Experience. Tune in for Andrew's Finnish-ing Move and this week's installment of Hollywood Translator. Find Ranking The Kingdom on Facebook or by searching Ranking The Kingdom on your favorite podcatcher. Find Burr/Jani Martin Experience right here on the Pants Pending Studios Entertainment Network. Peanuts, Horses, the Nords, Meeting our Heroes, Story Time, Superman, Pizza, Stand Up Comics, Drug Dealers, Alex Inc, Black Mirror and other Netflix Originals, The Mist in its many incarnations, Goodbye Tom. 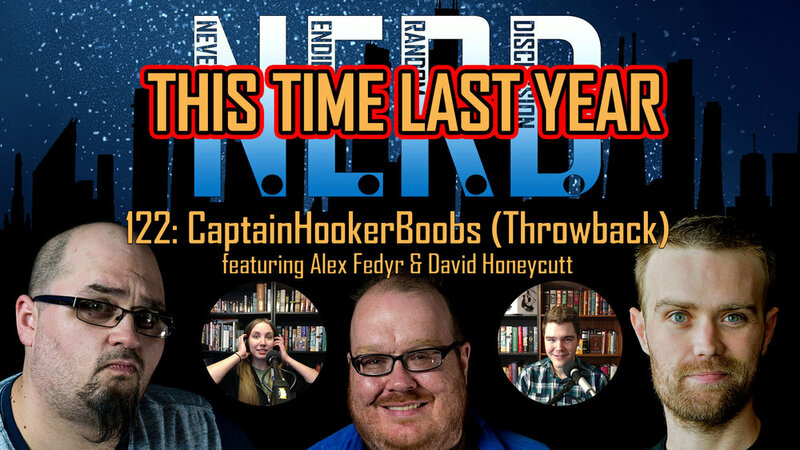 On this week's show your NERD crew is joined by comics Jessica Watson and Michael Glatzmaier, a mix to bring all the laughs. Tune in for that and get the latest Andrew's Finnish-ing Move and Hollywood Translator. It's a special edition. Our recording night fell on the same night as Pants Pending's company holiday party. The NERD crew was present, and we captured some of the fun of the party. We finished off in the studio. Andrew, Steven, and Producer Gilman welcome Aleisha Maureen and Greg Hanson from Heart Avail. Tune in for tunes and loons. It's gonna be a bumpy ride. Andrew and Producer Will are swarmed by unusual holiday characters on our annual Holiday Special. Take a tour down the jingle road for some wacky, weird, comedy fun. Special thanks to Phil Lindsey and Alexander Gun Gun Shotgun Machine for helping us out on this episode.